Ah, Christmas. The gift I give to myself is a few hours to write. The blog has been quiet for a while, but I do have 60 draft blogs I hope to roll out. While I’m doing a whole blog on this rod, I thought that this underwrap I developed might be interesting enough to be it’s own post. Typically an underwrap is done under a two-footed guide or a hook keeper. I’ve done a few before and posted images of them. You make one by doing one long wrap the length of the guide. You might include a special inlay or design between where the feet go, and then you color protect it, place the guide, and rewrap over the guide feet. See how the red dips in the upper wrap and the blue in the bottom? Not my work. Off a rod-building site. Here, from one of my builds, you can see the yellow underwrap below the hookkeeper and the brown over it, creating the step, that becomes the hourglass once you epoxy it. Here is a rewrap of the same, with the yellow/red all done in one wrap and trying to put the hookkeeper over it. And here is one with blue over blue. 2nd layer of hook keeper wrap with inlay. Finished hook keeper waiting for epoxy. 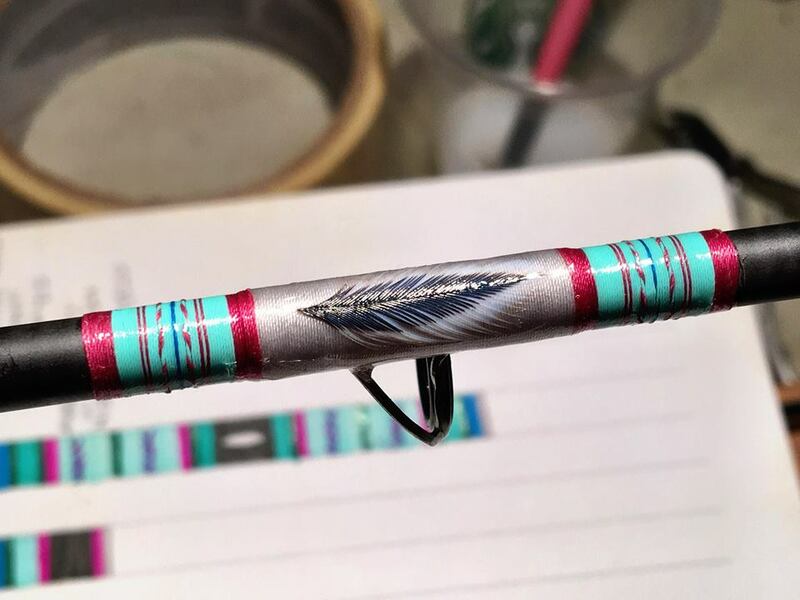 On my most recent build, we decided to a feather on the handle, and to carry this motif up to the two-footed stripper and tamer guides. To do this, though, I wanted a really flat wrap, with no hourglass. First, I laid my under wrap, packed it, color protected it (probably unnecessary since 100% would be covered, but I didn’t want to take any chances), and clear-coated that with a fast-drying one step clear coat. Packing the underwraps. You can see few random test wraps to the left. Then, I placed the guide on the blank with a rubber band on one foot, and wrapped the first foot. Once the first foot was wrapped, I took the rubber band off the second foot and started wrapping under it. It was a bit tricky but you get into a rhythm: use your left forefinger to lift the unattached foot. With your right hand, take the slack off the thread, slide it under the foot, release the guide, and roll the thread spool back to put it it back under tension. Guide lifted loose thread being guided home. You can really see the clear coat here. Then, I used a dental pick to pack every single thread against its neighbor.The glossy top coat on the first wrap that you can see here really helps out. Normally in this situation I would turn the rod around and wrap up the guide. But here, the second foot wrap is a bit tricky because since it’s a continuous wrap from beginning to end you are wrapping down the second guide foot. So, guide prep, guide prep, guide prep. That foot has to taper to be thinner than the thread thickness. Trust me, I took it out once. Here is the final wrap. I used the little step on the end to bridge up a band. Note the total lack of indentation on the side opposite the guide. I actually took this wrap out. Can you see the little gaps in near the toe of the foot, just past the shadow in the lower left? That drove me crazy. Lesson learned: guide feet have to be prepped to be thinner than the thread. About a perfect a wrap as I am capable of. I’m sure lots of people do this, I’ve just never seen it. It would be an unnecessary and painful piece of work to do an olive wrap or inlay this way, but for our purposes, I think it was necessary. When you get the hang of it, it takes about 45 min, or one streaming episode of Elementary. Anyway, it’s logical and one of two or three ways I imagined I could do it, fortunately the first way worked and worked well. I hope this little trick helps you out. Adding the feather in a sea of Color Protectant. You can see how I wrapped the pink bands up on to the little shelf of the guide wrap. In the background are some of the design sketches. A nice flat, wrap. And I carried that motif of band, band, inlay, band all the way up to the tip top. That last 1/4″ took me an hour. And here it is with the feather. Notice, no hourglass.